In this post I'm going to take a closer look at the most striking feature of this costume, the pleated gown itself. As mentioned in my first post I'm sure that it was inspired Mariano Fortuny's Delphos gowns, but the technique he used to create the special pleating has been lost. I'll work from the bottom and up on the gown. This is the very bottom of the dress. It's visible that the pleats are box pleats. At the bottom they are shallow and spaced quit a bit apart. This picture also gives some information about the fabric. It's possible to distinguish diagonal threads in the weave, at the same time there is also a visibly lighter field at the end of the fabric. This to me gives two possibilites. The fabric has a twill weave, the skirt is constructed of square pieces and they used the selvage edge instead of hemming the gown. The fabric is cut in a circle, leaving some of the threads running on the bias, and the lighter field is the result of some kind of starch/glue that was used instead of a regular hem. It should be noted that the whole round bottom of the gown was starched. I do not have evidence of this anymore, but here is anecdotal evidence. The costumes of Star Wars were presented at the NY Fashion Week, in a proper runway show. A fellow Star Wars fan was lucky to get tickets to the show, and she was able to take amazing photos. Some of her photos can be seen at Padawan's guide, but her own complete album has been taken down. One of the photos that I remember seeing was when the model wearing this gown turned at the end of the runway, and the whole bottom part flipped up. This shows that whole piece was probably starched to keep that round and flat shape. If we move up from the bottom roundel it's possible to see that when the roundel turns into the skirt part, then the box pleats are spaced closer to each other, I would also think that they are deeper. The variable pleats are also visible here. Compare the very straight and even pleats under the sash/obi to the ones that are more uneven in order to accomodate the curve of the bust. The gown ends on top in a quite square neckline, with rounded corners. The neckline is edged with a thin plaited cord. The round circle shows where the neckline has flipped a bit, and at least on my original photo it's possible to see a bit of sheen there. The sheen is different to the outer fabric, which I take as proof that at at least some of the gown is lined in a shiny fabric. 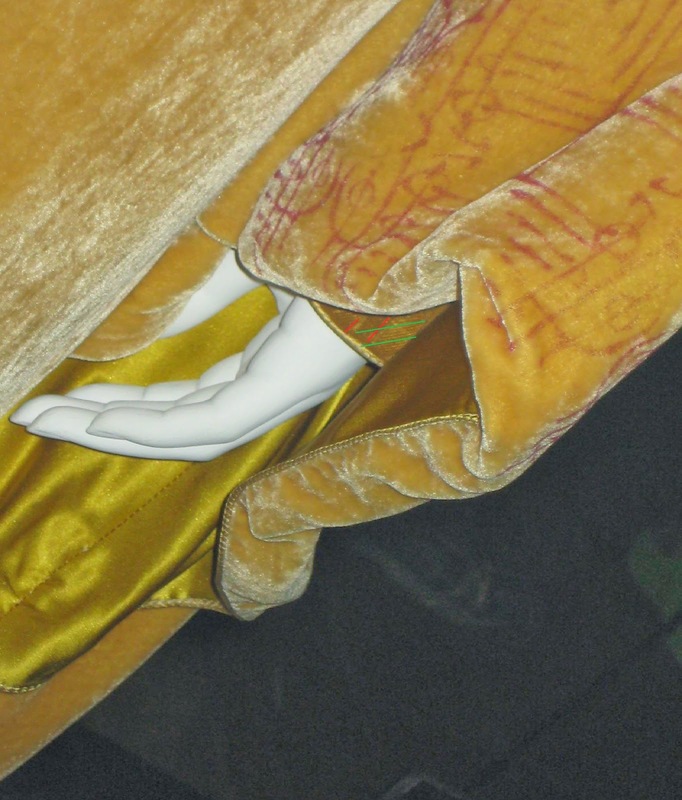 The sleeves are almost always hidden under the sleeves of the robe. 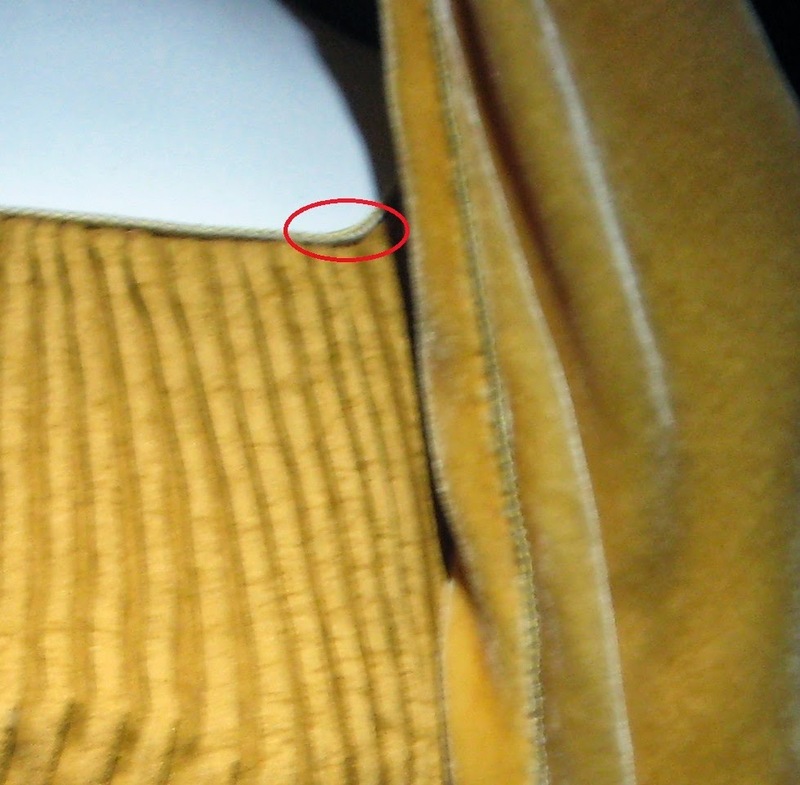 Here it's possible to see the hem of the sleeve of the gown. I've once again tried to mark what I see. The green lines are the weave in the fabric, the red could possibly be a pleat, but it's also possible that the sleeves were left unpleated. The hem is ended with the same narrow plaited cord as the neckline. So to summarize my analysis of the gown: A lot of the shape in the gown comes from manipulating the width and depth of the box pleats. The gown is lined, but not the whole way to the bottom, since no lining can be seen at the edge of the roundel. The roundel itself is heavily starched. The fabric is probably some kind of twill. I have learnt that there is something called silk twill, and I'm really curious if that might be the fabric that was used. In the next part I'm going to take a look at the sash/obi.